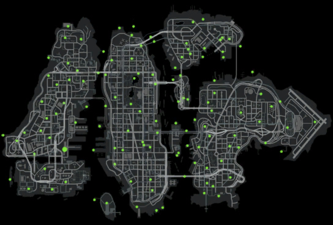 The map of all weapon spawns in Liberty City in Grand Theft Auto IV. The hidden weapons that The Mayor wants you to find. Weapons are at the forefront of all Grand Theft Auto games. Ranging from bare fists to a simple baseball bat to fishing knifes to rocket-propelled grenades to dildos, there are many different weapons throughout the series. This article mainly details weapons in the GTA III Era and HD Universe. In Grand Theft Auto: San Andreas, the player can increase his/her skill for a particular weapon by practicing, using the weapon either on a shooting range or on real targets. For each individual weapon, the player can achieve three skill-levels: Poor, Gangster and Hitman. On the Hitman skill level, the player is able to fire lighter weapons whilst walking, as well as being able to double-wield certain weapons (one in each hand). Entering/exiting certain vehicles, e.g. the Caddy gives the player a golf club and the Police Car gives the player a shotgun. This is a list of weapons and weapon types in GTA III era games and HD Universe games. Not all of them are available in all games. They are grouped by the weapon slots from GTA San Andreas. This page was last modified on 19 May 2014, at 04:01.